Ken is the founder and senior partner of Rexroth Farms. He started farming in 1961 and formed Rexroth Farms partnership with his son Jim in 1993. He currently manages daily dairy and livestock operations. Ken's son Jim is the junior partner in Rexroth Farms. He currently manages field operations, marketing, logistics and land partner relations. He also assists with the dairy and livestock enterprises. Basic Duties: Repair and maintain farm equipment (tractors, skid loaders, implements, pick-up trucks, road tractors and trailers, etc.) Fix in field break equipment breakdowns. Feed beef cattle. Keep shop and service truck stocked with all necessary parts and supplies. Drive truck to transport grain and other agricultural materials. What career path would you have chosen if you were not farming? Why? Basic Duties: Feed, bed, and care for beef cattle and dairy calves. Clean and maintain barns and pens. Oversee other livestock care takers to ensure health and comfort of all cattle. Assist Kenny with any day to day duties at the dairy. Operate and maintain grain system (dryer and storage facilities). Favorite Machine: Skid Loader Hobbies: Volunteer at Craley Fire Dept., spending time with family. Basic Duties: Plant all soybeans, wheat, barley, rye, etc. using no-till air drill. Back up combine operator. Assist with maintenance of cleaning of animal facilities. Assist with maintenance of equipment and farm buildings. Basic Duties: Operate equipment like combines and tractors during harvest times. Assist with cattle care and equipment maintenance. What career path would you have chosen if you were not farming? Why? Carpenter, because I enjoy building things. Name one goal on your bucket list: To have my own farm one day. Basic Duties: Assist with feeding and caring for beef and dairy cattle. Operate equipment, tractors, manure spreaders, grain cart, disk, etc. Assist with maintenance of equipment and facilities, as well as general mechanical tasks. Gary is a full time employee at the dairy facility. 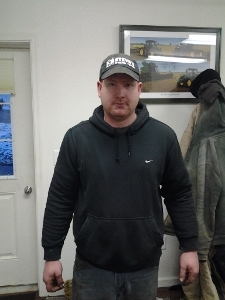 Kevin is a flex time employee primarily involved in field operations and trucking. Kevin also owns and operates a small farm in Lower Windsor Township. Steve owns his own tractor repair business and does repair work on our farm tractors, and road tractors, as well as restores Kenny's antique tractors. Steve is also a great pinch hitter for when we need help with field operations. Steve has helped in harvest times by operating a combine and driving truck. Eddie primarily involved with property and grounds maintenance. He is also involved in some field crew duties. Bob is the owner and operator of the river barge that we use to farm the islands near Goldsboro. D'neil is Jim's wife, and joined the office staff in 2015.